Do you feel disrespected or worse yet…LAZY for pursuing your online business dream from those that love you most? The hardest part about starting an online business is feeling like you don’t have the support you need from those closest to you to feel good about what you want to accomplish. When I started trying to figure out this whole big online world I knew I wanted to build a business I could be proud of AND bring home the bacon. The support I wanted from my family wasn’t there at the time but I knew in my heart that this was the right path for me. I didn’t know how I was going to do it but I felt a strong pull and confidence that I could do it. My advice to you is believe in yourself and grind it out even when you don’t feel like it to make your dreams come true. Looking for a group of like-minded women who will support you, teach you and learn a thing or two from you too? 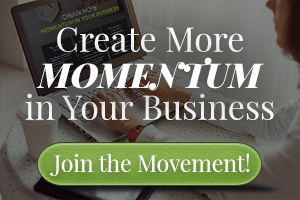 I love to hang out with the gals in the Momentum Monthly Mastermind!